As a child growing up in rural India in the 1960s and 1970s, Naveen Jain would gaze up at the moon and imagine a life beyond his modest surroundings. Today he’s still gazing at the moon, but for far different reasons. Jain, 55, is co-founder of Moon Express, a Mountain View, Calif.-based company that’s aiming to send the first commercial robotic spacecraft to the moon next year. This serial entrepreneur—he founded Internet companies Infospace and Intelius—believes that the moon holds precious metals and rare minerals that can be brought back to help address Earth’s energy, health and resource challenges. Among the moon’s vast riches: gold, cobalt, iron, palladium, platinum, tungsten and helium-3, a gas that can be used in future fusion reactors to provide nuclear power without radioactive waste. It’s an exciting prospect, considering supply on Earth for such rare minerals as palladium—used for electronics and industrial purposes—is finite, pushing prices to $784 an ounce on April 2. Jain’s Moon Express is not alone in its quest to harness the moon’s riches. Several other Silicon Valley start-ups, such as Planet Labs and Masten Space Systems, have been making headlines recently as they enter the space exploration market, an endeavor long associated with, and controlled by, the government. At the same time, the global race is heating up with the Chinese government’s recent success in landing a robotic rover on the moon in December. To fast-track innovation and bring a deep well of space knowledge to the company, Moon Express made a strategic—and highly symbolic—hire in mid-March when it announced that Andrew Aldrin, 55, son of Apollo astronaut Buzz Aldrin, is joining the company as its president. He is an industry veteran who was the former director of business development for Boeing NASA Systems who has a track record of commercializing space technologies. Helping to drive this newfound interest in privately-funded space exploration is the Google Lunar X Prize. It’s part of the X Prize Foundation, an educational nonprofit organization that looks to address the planet’s biggest challenges by creating and managing large-scale, high-profile competitions to stimulate investment in research and development. Moon Express is one of a handful of teams from around the world competing for the $30 million Lunar X Prize, a competition organized by the X Prize Foundation and sponsored by Google. It will be awarded to the first team that lands a commercial spacecraft on the moon, travels 500 meters across its surface and sends high-definition images and video back to Earth—all before the end of 2015. Jain’s own belief in attempting outsized challenges began in the early 1980s when he immigrated to the United States. Soon after finishing his MBA in India, he was recruited by IT company Unisys and worked in Silicon Valley as a computer programmer for several years. In 1988 he married and moved with his wife to Seattle. “She thought the Pacific Northwest was a wonderful place to live, and I figured that if we were going to make that move, I might as well send my résumé to Microsoft,” Jain recalled with a laugh. The résumé landed him an interview, a job offer, and resulted in a seven-year stint at the software giant. It also solidified for Jain what he really wanted: to start and run his own company. He left Microsoft in 1996 and founded InfoSpace, an online email and phone directory company that he took public. It was valued at $30 billion several years later. In 2003 Jain started Inome (formerly named Intelius), an online database and public records company that has grown into one of the largest information commerce companies, with more than 25 million customers. With Moon Express, Jain feels he has that opportunity. 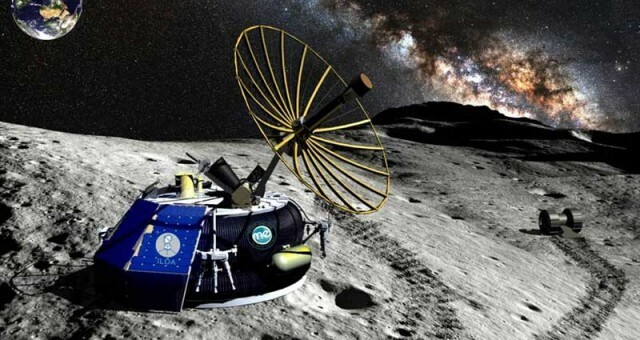 Along with partners Dr. Robert Richards, a physicist and founder of International Space University, a nonprofit organization that offers space training programs, and Dr. Barney Pell, Silicon Valley technology pioneer and a former NASA manager, Jain says Moon Express can offer more “democratic” access to the moon. “Now that we’re shifting from U.S. government-sponsored space exploration to privately funded expeditions, it’s important to look at how the resources of the moon could benefit everyone,” he said. “Once we can accomplish that, then the second or third mission can involve bringing things back from the moon,” he added. Successful enterprises don’t need breakthrough ideas, but require flawless execution. Dream so big that people call you crazy, and never be afraid to fail. Entrepreneurial ventures more often die from indigestion rather than starvation.